Gibson Console Grand Model High Steel Electric Guitar (1940), made in Kalamazoo, Michigan, serial # F1552-6, sunburst lacquer finish, maple body, metal inserts with rosewood fingerboards, original tweed hard shell case. Overall length is 31 in. (78.7 cm. ), 12 in. (30.5 cm.) width, and 3 1/4 in. (8.3 cm.) in depth, measured at side of rim. Scale length is 22 1/2 in. (572 mm.). Width of nut is 2 1/2 in. (64 mm.). This instrument remains in exceptionally fine original condition for a pre-WWII Gibson, showing only minor signs of use. There are some small dings and rubs, mostly near the tuning gears, but on the whole the finish looks little-used, retaining its rich and deep original shine. It includes the original red-lined tweed HSC with a period cable, steels, fingerpicks, and a nice original copy of the 1941 Gibson catalog featuring this instrument. The case has a name written on the lid, but everything else is original and unaltered. 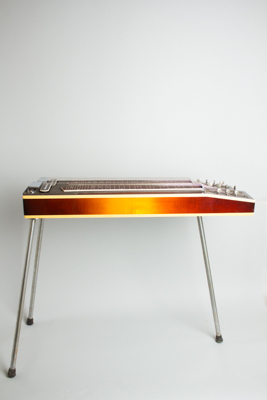 A truly beautiful showpiece instrument, and a rare piece of pre-war Gibson steel history. Only just over 100 or so Console Grands appear to have been shipped, and this must be one of the very finest survivors! Excellent + Condition.